China’s economic picture is getting uglier. Easy credit is exploding and home prices are shooting up, suggesting a possible bubble. Massive public investment is still one of the government’s go-to economic fixes. Policymakers seem to be edging away from the serious restructuring reform that they have promised, and analysts aren’t psyched about the buildup of credit risks. That could all change if China chooses another road — a productivity-led model. 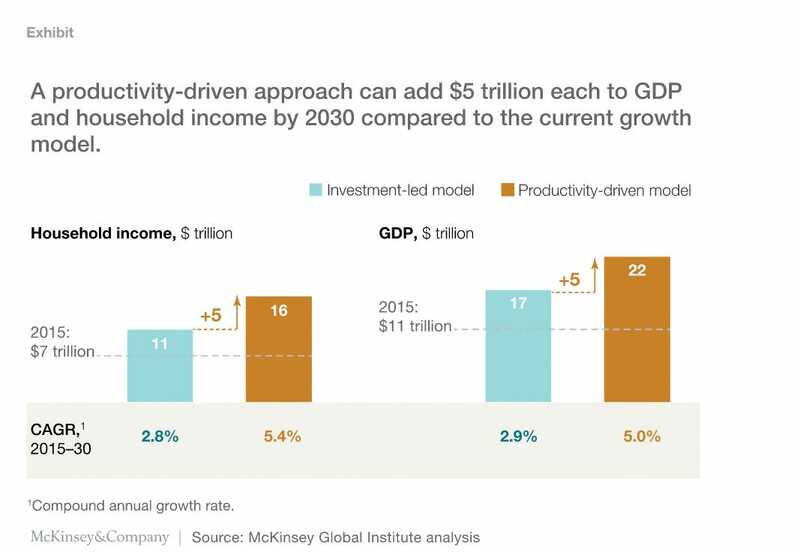 If so, China could add $5.6 trillion to its gross domestic product and $5.1 trillion of new income for households by 2030, according to a Thursday McKinsey Global Institute report by a team led by Jonathan Woetzel. “China needs to open up more sectors to competition, enable corporate restructuring, and further develop its capital markets. It needs to raise the skills of the labour force to fill its talent gap and to sustain labour mobility,” the researchers wrote. China risks a hard landing if it goes back to an investment-led model to support its near-term growth goals, according to the report. The researchers found that the non-performing loan ratio could reach 15% in 2019 from 1.7% today; for every year China continues on the current path, the cost of dealing with bad debt could jump by $310 billion to $460 billion. We’ve previously talked about how China’s latest effort to sort out its mountain of debt could make things worse. And of course, one can’t forget about the country’s capital outflow scare. 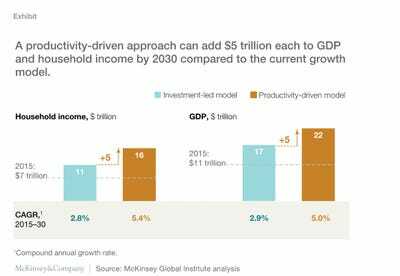 That’s not to say China can’t face such challenges, but as McKinsey’s report points out, it has a choice.